Place the potatoes in a large pot and cover with cold water by 1 inch. Bring to a boil and cook until the potatoes are fork tender, about 15 minutes. Fold in the spinach and cook for an additional minute. Drain the potato mixture and return to the pot along with ¼ cup stock, 1 teaspoon salt, and 1 tablespoon olive oil. With a fork or masher, smash the potatoes until semi-smooth. Add more liquid if the potatoes seem too thick and dry. Fold in the butter and taste for seasoning. Meanwhile, heat the remaining oil in a large cast iron skillet over medium-high heat. Cook the sausage until browned on all sides, about 4 minutes total, depending on the thickness. Set aside. Add the onions to the pan. Saute until soft and beginning to caramelized, scrapping up any brown bits from the bottom of the pan, about 15 minutes. Pour the cider over the onions and simmer until reduced by half, about 5 to 7 minutes. Season with salt and pepper. Add the sausages back to the pan and turn to coat in the onion sauce. 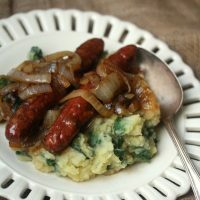 Divide the potato mash between 4 plates and top with the sausages and cider onions.